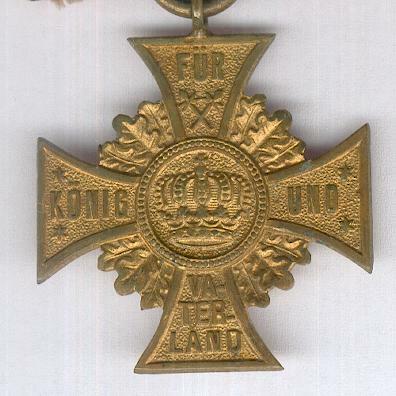 Gilt cross pattée with oak leaves between the arms and with loop for ribbon suspension; the face with a circular central medallion bearing the Bavarian crown, the upper, left, right and lower arms inscribed respectively ‘FÜR’ ‘KÖNIG’ ‘UND’ ‘VA. / TER. 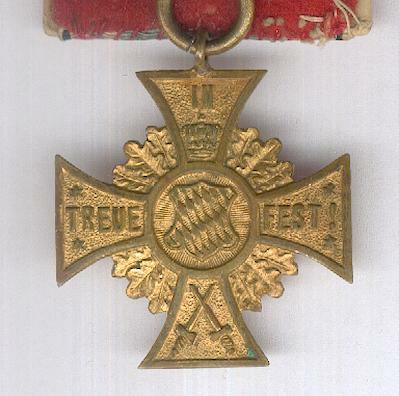 / LAND’ (For King and Fatherland), inverted crossed swords at the base of the upper arm, six-pointed stars at the upper and lower ends of the lateral arms; the reverse with a circular central medallion bearing the Bavarian arms, the upper, left and right arms inscribed respectively ‘IN’ ‘TREUE’ ‘FEST’ (In Steadfast Loyalty, motto of the Bavarian Army), the Bavarian crown at the base of the upper arm, six-pointed stars at the upper and lower ends of the lateral arms, crossed swords on the lower arm; on original age-faded ribbon parade-mounted for wear and with bronze crowned ‘K.B.11. 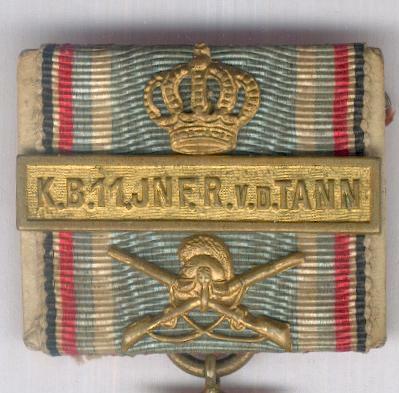 JN F.R.v.d.TANN’ clasp above a bronze cuirassier helmet imposed on crossed rifles. 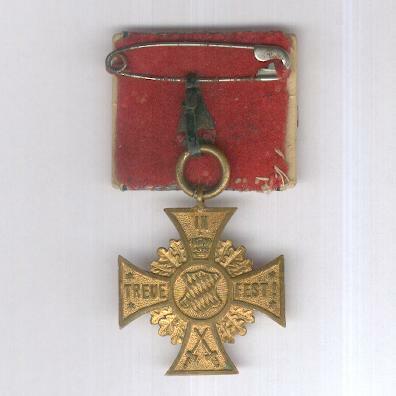 The Cross was awarded to Bavarian regiments in about 1900. The Regiment was instituted on 27 September 1805 as the 13th Infantry Regimen of the Line and was mobilised and moved to Upper Austria later that year but did not engage in combat. It fought against Prussia and Russia 1806-1807, against Austria in 1809, Russia in 1812 and France in 1813-1814 and 1815. The Regiment fought in Greece in support of the Prince Otto, second son of King Ludwig of Bavaria, who ascended the newly created throne of Greece on 27 May 1832 where it remained until 29 June 1834. It fought with Austria against Prussia in 1866 and in October of that year King Ludwig II appointed Lieutenant General Ludwig von der Tann-Rathsamhausen commander of the Regiment and it bore his name until disbanded on 15 December 1918. In the Franco-Prussian War of 1870-1871, the Regiment fought at the Battles of Weissenburg, Worth, Beaumont, Sedan, Rambouillet, Artenay, Orleans and Chatillon before participating in the Siege of Paris. In World War I it participated in the Battle of Lorraine and advanced on St. Mihiel before being stopped by the failure to cross the Meuse. It fought at Verdun, Fleury, on the Somme, at Messines and in the tank battle at Cambrai in November 1917 before being transferred to the Hindenburg Line. In 1918 it suffered heavy casualties at Bapaume on 27 August before retreating into Flanders. 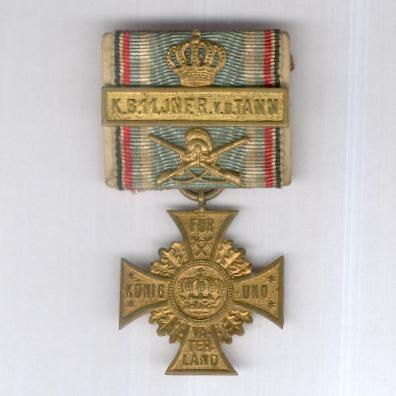 The Regiment was demobilised at Regensburg on 14 December 1918 and disbanded.